The air force has enlisted the country’s first science company. The soldiers of Russia’s first science company at the Voronezh Air Force Academy (around 320 miles south of Moscow) have taken their oath. Unlike other armed forces, their life is regulated not only by army rules but also by special RF Defense Ministry Order 404. These soldiers have no assault rifles: They had to borrow them from nearby military units for military exercises and the oath of enlistment. Instead, the company’s weapon is intellect. “The soldiers are engaged in scientific work four days a week, from Monday through Thursday. Friday is devoted to routine army disciplines: marching drill, tactical and physical training,” says the company’s commander, Maj. Viktor Merzlov. Before he was appointed commander of the intellectual special force, Merzlov was the course officer at the Air Force Academy, and he served at Armavir airfield (850 miles south of Moscow) before that. In September, Viktor will be defending his dissertation, which is devoted to switching diesel engines to methane. The servicemen in the science company have their work all planned out for their entire term of service. Each of them has his own science tutor, who has provided the solider with a plan for working on a problem that is relevant to the army. Since the company is under the wing of the air force, the topics have to do with aviation. Maksim Teplitsky of Khabarovsk is building a mathematical model of an aircraft. It happens to be a Yak-130, but, by replacing values in the program, one can get a Su-35 or any other aircraft. Once the model is built, it will be exposed to all manner of virtual woes: strong side winds, hitting light air created by a plane or turbulence, etc. After analyzing the plane’s behavior in a critical situation, the soldier will come up with recommendations for the designers and the crew—what needs to be improved and how to act in an emergency. In civilian life, Teplitsky enjoyed swimming and martial arts. Science company soldiers have been promised three gym sessions a week and a swimming pool on Thursdays. The hall of residence (“barracks” seems a misnomer) has brand-new sports equipment, but one suspects this is there just to please inspectors. The army intellectuals live four men to a room. Each room has a big TV set: All the servicemen in the Russian Army, regardless of their intellectual level, have to watch the Vremya evening news program at 9 p.m. The soldiers have hot water, shower stalls and a vacuum cleaner. Anton Sharafutdinov from Ufa and Viacheslav Zvonnikov from Rybinsk are working to improve an engine compressor. Their task is to minimize the air swirls in the engine that make it less efficient. Anton is a theoretician; he tests variants on the computer. Viacheslav is a practitioner: He checks out the variants by pouring ink-tinted water onto a moving compressor rotor. The marker detects turbulence. “Experiments are what every student dreams of. That is why I signed up for the science company: working here is fun; it won’t be a wasted year for me,” says private Zvonnikov. Sharafutdinov likes the strict routine. Next to the room where they work, there is a gun for firing pebbles onto turbine blades. Extraneous objects getting into the turbine during takeoff and landing is a scourge for aircraft; half the air force planes suffer from this. The gun was designed by an international team: The turret was built by a cadet from Nicaragua, the barrel from a pipe from a Ukrainian munitions plant, and the fixing for the blades was designed by an associate professor from a power unit department. The gun fires a wad that surrounds a pebble of the required size. Colleagues bring shells from airfields, where they go on business trips. “You can fire a sparrow — a dead one of course,” says Maj. Yevgeny Neskromny, who designed the contraption. Anton Panzhev from Astrakhan works in a huge hangar with semi-dissembled planes, helicopters, motors and rockets. Cadets here are trained to become aviation engineers. Anton already holds a degree as a test engineer and is developing software for an aviation simulator. 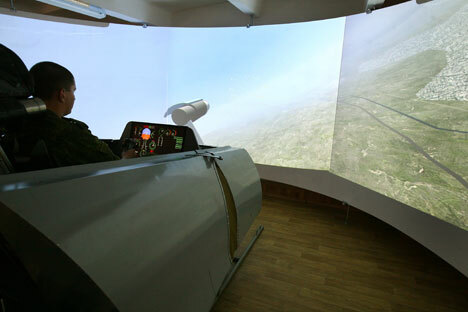 In the adjoining room, there is a Mig-29 cockpit with a panoramic screen for testing the way the plane behaves in various modes of operation. Private Panzhev has not had any real problems during his month here. Just trifles: Once he was told off for not lacing his boots properly. The company commander tries to be democratic with the soldiers. “They are adults with university degrees; we speak the same language. A kind word does more than shouting and drill,” says Merzlov.